Home » Training » How Do Actors Bulk Up So Fast? If you have watched Iron Man 3, chances are, like the rest of the world, you are wondering, what Robert Downey Jr. did to get into shape. The actor was almost skinny in Ally McBeal. So drastic is the change that one wonders if anyone still associates the actor with his role in that sitcom. This is a question that seems to be repeated over and again. The answers are usually critical, and often merely speculative. Some suggests the use of steroids, while others talk of crash diets and still others speak of the privileges of the rich and famous. However, the fact of the matter is that it all boils down to an actor’s total focus, and the complete dedication with which he approaches his target. If you are still wondering how actors bulk up so fast, here are some answers. Most actors who have beefed up for a role have achieved spectacular results simply because they worked hard and they worked smart. They followed exercise regimes that pushed their bodies and minds to achieve more than they could have ever imagined. While they worked out with personal trainers, they also had nutritionists who told them what they should eat and when they should eat. A combination of diet and exercise is the only way for an actor, or for any person for that matter, to bulk up fast. Now let us take a closer look at some of the physical transformations in Hollywood that has everyone talking. Robert Downey Jr.’s trainer says that while he may have been on the skinnier side before Iron Man, he was in great shape because of Wing Chun. The Chinese martial art focuses on close range combat and requires the artist’s total focus and concentration. When Downey began to prepare for the role of Tony Stark, his trainer started him on a periodization program that required him to alternate between a combination of heavy weights with low reps, and lighter weights with more reps. He worked out five times a week for anywhere between 40 to 90 minutes. The time period of the workout was only known to the trainer so Downey had to work hard all the time, and there was no opportunity for him to take it easy. His workout consisted of bench presses, dips and military presses, or in other words his coach focused on classic old school weight training. This helped increase his muscle mass and made him stronger and tougher than anyone would have ever expected. He also focused on only one specific part of the body during each workout. By the time he was ready to get in front of the camera for Iron Man, the actor had achieved 25% increase in lean muscle, 20 pounds. He was able to triple his shoulder press and double his bench press. 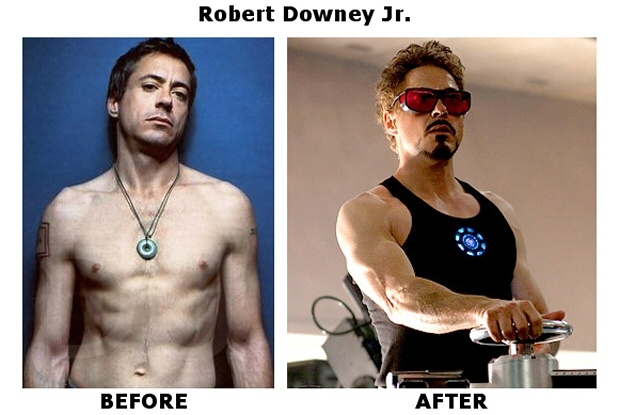 In other words, Robert Downey Jr.’s leaner, meaner avatar was achieved with good old fashioned hard work and sweat. When it came to his diet, his trainer and nutritionist came to the decision that he would eat frequently, every three hours. His diet was a strict one and calorie dense. Unlike a lot of other actors, Downey’s nutritional regimen was divided into a 30:30:40 proportion. This essentially meant that his meals composed of 30% proteins, 30% fats and 40% carbohydrates. For over a period of nine months the actor’s daily nutritional intake was over 5,000 calories. The explanation for this decision is simple, if you want to bulk up fast, you have to eat accordingly. 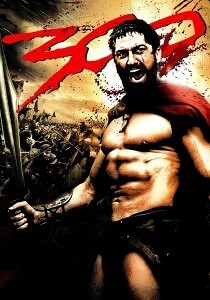 It only took the audiences one look at the 300 poster to realize that this was a movie about strength, grit and glory. Gerard Butler’s ripped body was a result of what later came to be known as the ‘300 rep Spartan workout’. Quite clearly this is an advanced workout, one meant for someone who is already in excellent shape. Butler did not add as much bulk as one would imagine. Instead he lost fat weight. It took him four months to achieve the look that suited his character, King Leonidas. He worked out twice a day, for five to six times a week. Instead of using machines, the exercise regime focused on more traditional exercise tools such as the kettlebell. If you look at Butler’s before and after 300 pictures, the loss of fat weight offers an excellent contrast in the structure of his body. Also, before every scene Butler pumped up. This basically meant that he did weights or push ups to increase the blood flow to the muscles, thus making them look bigger. The 300 workout is not for the feeble spirited. It aims to increase physical fitness as well as mental endurance. It is indeed a workout worthy of a Spartan warrior. 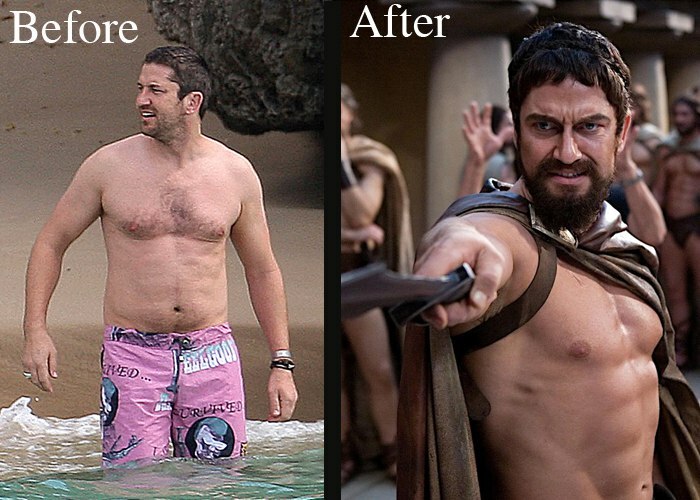 When it came to the diet followed by Gerard Butler and the rest of the 300 crew, they went the Spartan way. The trainers chose calorie restriction over a calorie overload approach. This helped created bodies and looks that made the audiences think that the men indeed lived off the land. The film crew exercised, conditioned and ate together. Since they never really knew what kind of physical challenges would come their way each day, they learned to depend on each other. If you are considering bulking up, it is a good idea to have a workout buddy to share the experience with, and to encourage you on. Ryan Reynolds has come a long way from his Two Guys and a Girl and Van Wilder days. In the initial part of his acting career neither did he focus on a regular exercise regime nor did he have a particularly healthy diet. However, when he agreed to do Blade: Trinity, the actor decide to test his limits of endurance and discipline. Even before he began the scheduled fitness regime that would help him prepare for his role, he began to do 500 to 1000 sit-ups daily. With a sense of what his body and mind could achieve, he then followed a strict exercise routine six days a week, for three months. Every day his exercise schedule would focus on one part of his body. His trainer had designed a workout that included heavy weights and less reps. He would change the workout daily so Reynolds would be left guessing and his body and mind would have to accommodate. The basic idea was to help him bulk up, quickly. Google an image for the film Machinist and then for Batman Begins, and you will find yourself asking the ever popular question. How do actors bulk up so fast? Christian Bale’s transformation seems nothing short of miraculous. He had lost a tremendous amount of weight in a short span of time, with a starvation diet. For Batman Begins he had to put back the weight and also get into a shape befitting a superhero. The human body is incredible in the ways in which it recovers from drastic physical changes. It has a muscle memory that allows it to regain the muscle fiber as it was before the drastic weight loss. 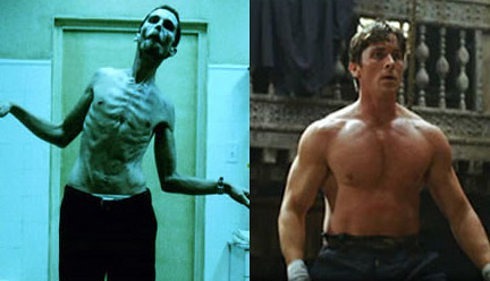 Before the Machinist, Christian Bale was in excellent fitness condition, and this was crucial for his training for Batman. While Bale did cardio every day of the week, he trained for five days. His workout was usually cardio intensive and also included a healthy dose of weight and resistance training. His trainer opted for more reps over heavy weights. Compound exercises were a highlight of Bale’s workout, and included several exercises, the most common being the squat, military press, bench and deadlift. Bale says that he gorged on junk food to help him regain his weight, and the workout helped him burn calories. He would eat a meal every two to three hours. And the nutrient content would be in a ratio of 1:2:3. This meant that for a portion of fats, it included two parts of proteins and three parts of carbohydrates. Actors who bulk up for their roles are dedicated and disciplined when it comes to their workout and lifestyle. They choose to work with the best trainers and nutritionists who can help them sculpt their body to match the role that they will play in a film. It is possible for any man to bulk up or get ripped, if they are committed to the purpose. Clearly bulking up has a lot more to do with an actor’s mental strength and determination than one would have imagined when looking at a picture on the internet or a movie poster.